Introduced as bud wood in 1911 from Atlixco, Puebla, Mexico. A hybrid Mexican variety that is ready to pick in November and is good through March. Hangs on the tree well. A long time California commercial variety valued for its winter season and its B blossom type. Skin thickness is medium thin. Seed size is medium large. 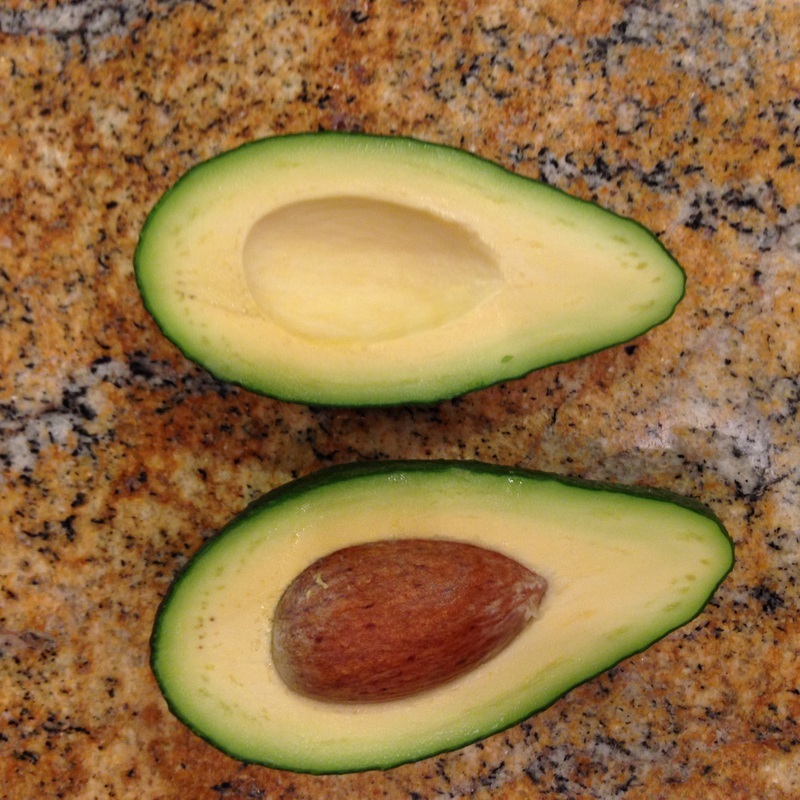 This avocado started the California avocado industry up to the time Hass took over. 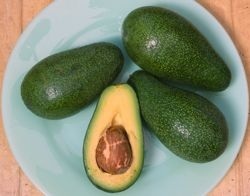 Fron this wed location http://www.hort.purdue.edu/newcrop/morton/avocado_ars.html comes this information about this avocado susceptibility to diseases in Florida; "Subject to scab and anthracnose in Florida" It does not say anything else. I guess we will find out in a few months. If it taste as good as the ones grown in California I would not mind spraying this tree a few times a year. February 14, 2013: A tree was top worked. Now we sit and wait for 24 months. Looks good. April 14, 2013: The grafts are doing well, we have a take on Fuerte. I Tasted some home grown Fuerte's from California early in the year and they were out of this world. Much better than store bought imported Hass, by far. If I can get 1/2 the quality here in Florida I would be very happy. July 11,2013: Fuerte tree is doing well is growing a lot, 5 months post top working. See picture. November 1, 2013: The tree is doing well. I saw some Fuerte fruit for sale at Pine Island Nursery, I did not buy any, they seemed small but I will pick up some next week just to see. I'm curious as to the flowering time of this B flower fruit. November 11, 2013. The fruit from Pine Island nursery got a bit soft so I decided to try it. Good looking fruit, small seed. The larger one of the two into the 9 oz range. It felt texture wise that it needed more time in the tree. Like it was not done. Some of the outside lesions were manifesting inside the fruit so I had to cut off some pieces due to black streaks. Flavor wise seemed very band and lacked taste. I'm not opposed to bland tasty avocados, like the Pollock. In California this fruit stays in the tree from November to March. I'm hoping this was picked too early. I hope my tree sets some fruit so I can monitor the fruit quality over the winter. Comparing it with the picture above seems like they needed to get a bit fatter. February 14, 2014: The tree is pushing vegetation on top. Some flowers buds are clearly coming along , possible we can have 50/50 flowers and leaves. The tree looks good and strong. Took some pictures. I'm not expecting any fruit this year. Hoping for a few next. April 4, 2014: Looks like the tree did not set any fruit on its first flowering. April 13, 2015: This tree is huge, close to 20 feet high. The flowering was small and weak. I see a few fruits nickel size on the tree but nothing like the possibility this tree can support. May 1, 2015: Not a lot of fruit in this tree. Probably not worth growing in our area. The tree is huge compared to other grafted at the same time. September 24, 2015: The Fuerte tree is huge. It has a small amount of fruit for its size. Some fruit on the ground. I did notice one fruit cracked on the tree. See today's picture's, seems like the daily rains and heat are too much for the fruit to handle. I did see a large one 14 oz and I pick it to see how and if it ripens. October 14, 2015: Fruit is dropping like crazy. Most with broken skin, even on the tree. This variety does not like our wet summers is So. Florida. Can not handle it. Huge tree. Not a keeper. Ending coverage.